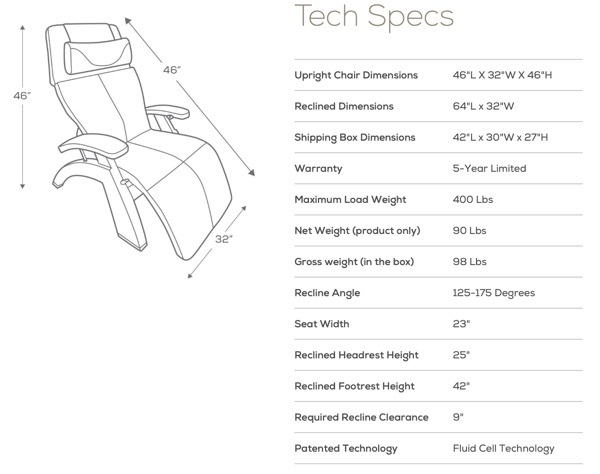 If you love the original Perfect Chair with its comforting, back-pain thwarting zero gravity position that originated from NASA engineers, you'll love the enhancements that the new PC-LIVE Perfect Chair from Human Touch delivers. So where did the PC-LIVE Perfect Chair come from? Well, Human Touch learned from many years of experience (and so many satisfied customers) that Perfect Chair owners actually use their zero gravity chair in normal seating positions aside from the zero gravity position for normal everyday sitting functions. These activities include reading, watching TV, entertaining, eating etc.. Unfortunately, when sitting in these positions for lengthy periods, you can adversely affect your lower back, nerves and other parts. Aah, the PC-LIVE is born to assist us in those "regular seating" times of need. Human Touch created the PC-LiVE, to include the zero gravity benefits that allow your weight to be evenly distributed over the entire Perfect Chair seating surface, which helps to eliminate the unhealthy and painful stresses caused by gravity and your own body weight working against your lower back and spine. In a nutshell, the PC-LIVE delivers back-pain reducing comfort that has been enjoyed for years in its zero gravity chairs, with the standard seating improvements that you can benefit from in your quest for relaxation and your everyday lifestyle sitting. 3D EasePoint Technology Cushion- This proprietary and patented fluid-cell cushion is hermetically sealed and displaces pressure in three dimensions by distributing pressure across the entire seating surface, eliminating harmful pressure points. This technology becomes especially helpful when you are sitting in non-reclined positions. Super-strong steel frame- High-tensile strength steel is sandblasted, cleaned, then powder-coated with a protective surface that ensures long-term durability and a smooth, quiet glide when reclining. Far-infrared Jade Stones- The healing properties of far-infrared Jade Stones heat to soothe tired, aching muscles, elevating the body to a new state of comfort and relaxation. Memory Foam PLUS seating- Luxurious high-density plush seating with premium, responsive Memory Foam PLUS to maximize ultimate comfort and provide ideal support while it contours the entire body. Full Support Head Pillow- The comfort pillow cradles the head and neck while providing ergonomic comfort. Extended Armrests- The wide and long armrests give constant support even as the chair reclines into zero-gravity. Power Recline- Smooth power recline with split-second digital acceleration at all recline angles. Adjustable Lumbar Support- The adjustable lumbar system is equipped with a release valve which allows you to customize your seating comfort with variations in lumbar support. Luxurious Premium Upholstery- Choose between black, espresso, or gray to look "at home" in almost any room. Solid, Sturdy Wood Base- The hand-carved and hand-sanded solid wood base is made from the rubber tree which is one of the strongest woods on the planet- Expect years of trouble-free enjoyment.